Last royal governor of North Carolina, 1771-75. Fearing capture, in June 1775 he sought refuge here. Fled offshore to HMS Cruizer in July. 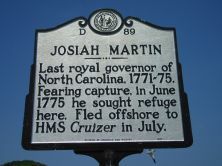 Josiah Martin (1737-1786), the last royal governor of North Carolina, aroused sentiment for independence in North Carolina through his inflexible loyalty to the Crown. He was born in April 1737 in Dublin, Ireland, to Colonel Samuel and Sarah Wyke Irish Martin of Greencastle, Antigua. He spent most of his first fifteen years in Ireland and England, travelling with his tutor to the West Indies in 1752. He did not care for the tropical climate in Antigua, however, claiming that it affected his health. In 1756 Martin reported to London to study law. There his older half brother Samuel, a member of Parliament, used his influence to help Josiah gain favorable positions. Forsaking the study of law, young Martin for a time pursued a military career. Josiah Martin married his first cousin Elizabeth Martin in New York in January 1761. They had eight children, four of whom survived to maturity, but none of whom married. His brother Samuel’s efforts on his behalf finally paid off when Lord Hillsborough, the secretary of the colonies, was shuffling leadership posts. North Carolina’s governor, William Tryon, transferred to New York to assume its governorship. Josiah Martin, at age thirty-four, was named to succeed Tryon in December 1770. He did not receive the notification, however, until March 1771. By that time he was undergoing medical treatment in New York. It would be several months before he could move south. Martin inherited several problems from Tryon, among them the fallout from the War of the Regulation, an ongoing boundary dispute with South Carolina, and a controversy over the colonists’s rights over non-resident debtors. His term initially showed promise, as he was able to calm discordant feelings resulting from the War of the Regulation. The governor and the assembly worked together to produce legislation in 1771 to resolve the war debt. Yet, Martin’s loyalty to the Crown was without question. The Assembly in 1773 tacked onto the court law bill a foreign attachment clause, permitting colonists to recover debts owed by non-residents who owned property in North Carolina. Martin vetoed the bill because the attachment clause was unfavorable to the crown. The veto left the colony without a court system. For this the colonists blamed royal authority. 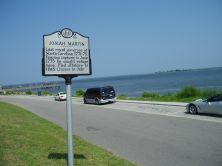 North Carolinians, holding Martin in contempt, convened the First Provincial Congress in New Bern in 1774. This convention recommended that counties form committees of safety, a move to supplant royal authority. In the spring of 1775 Martin complained to a correspondent that townsmen in New Bern were “actually endeavoring to form what they call independent Companies under my nose.” In mid-May he removed the cannons from their mounts at the palace. Within days a “motley mob” appeared at his door and demanded to know why the guns had been dismounted. The governor’s explanation was that the mounts were rotten, but the actual reason, as they suspected, was his fear that the cannons might be used in an insurrection. Concerned for the safety of his family, Martin quickly packed his wife and children off to New York. On May 24, under cover of darkness, the governor himself quietly stole away from the palace. The Cruizer would remain Martin’s headquarters through the summer and fall. From aboard ship, on August 8, he issued his “Fiery Proclamation,” denouncing the safety committees. In November he moved to the HMS Scorpion and sailed to Charleston to confer with the royal governor of South Carolina. In 1781 Martin was present with Lord Cornwallis at the Battle of Guilford Courthouse. He died in England on April 13, 1786.